You showed up in a show-stopping dress and with a husband at your side and your kids in hand, you created the perfect family photo. It was one of those classic “Instagram vs. reality” shots, where one moment everyone is all smiles and the next moment your son is crying. The best part was that you posted this unfiltered moment to share with the rest of us. I want to thank you for being so authentic with your following. 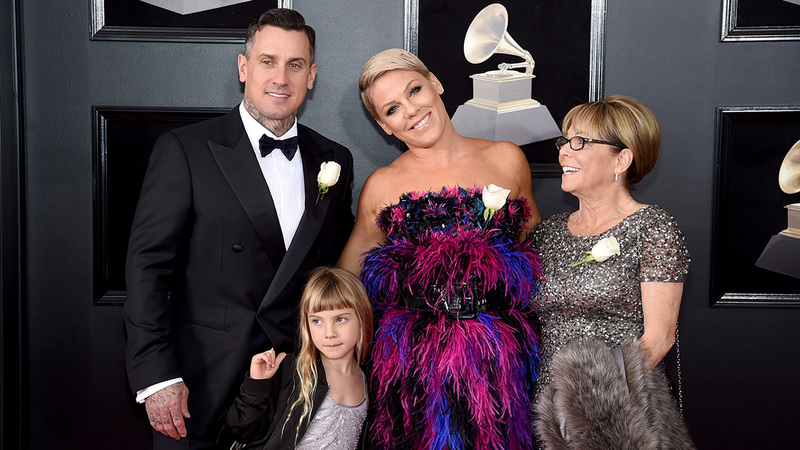 It served as a great reminder: Even an occasion like the Grammy’s will not prevent your kid from kicking, screaming or crying. The best part was your rad “way to a go” mom arm: raised and poised, fighting off the negativity most mom’s feel when they can’t comfort their little ones. You’ve always been a contrarian. Here you are, one of the few pop stars of the 90’s still standing tall in your career. Britney who? Christina where? Jessica what? You are a solo, female pop artist. A category dominated by women that look a certain way. You were the one with short pink hair, tattoos and killer abs. You stood out from the crowd as the tough one, the one not to F with, and yet you’ve remained approachable. As a Muslim, Pakistani American woman, I too do not fit the mold of my peers in my industry. I’m not typically thin, I don’t have the long beautiful hair or the killer professional wardrobe. I work twice as hard to be taken seriously, and constantly strive for recognition from my bosses: notice me for who I am and do not identify me as your token brown-girl hire. Last night, you went from ball gown beauty to stripped down and #fierce. You proved that you don’t have to objectify yourself to be recognized for your talents. We heard your voice. You gave us a compelling performance without the bells and whistles most stage performances have. As a woman of color, you reminded me that I don’t have to conform to the beauty standards of the workplace to be taken seriously. I can be smart and opinionated without falling to the siren call of the latest fashion it-item or the lipstick color of the season. You actually inspired my outfit today: a basic white sweater, black jeans, comfortable shoes and no makeup. Though it has a personal twist, it was for no one else except for myself.